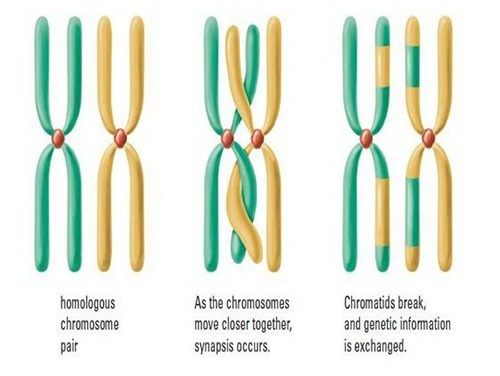 (a) Crossing over: The genetic recombination via inter-chromosomal recombination is called crossing over. (b) Independent Assortment: The inter-chromosomal recombination is called independent assortment. Genetic Recombination therefore shuffles already existing genetic variation. It does not create new variation at the involved loci. 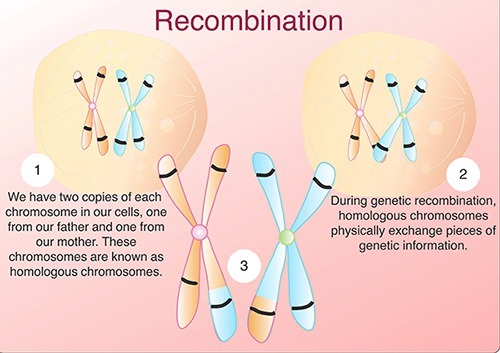 In molecular biology, recombination is the molecular process by which genetic variation found associated at two different places in a second DNA molecule. One mechanism leading to such molecular recombination is chromosomal crossing over. Such shuffling of variation is also possible between duplicated loci within the same DNA molecule. Sometimes, the number of loci in each of the recombinant molecules is changed by the shuffling process. It is called unbalanced recombination or unequal crossing over. Enzymes called recombinases catalyze this reaction. RecA, the recombinase found in E. coli, is responsible for the repair of DNA double strand breaks (DSBs). 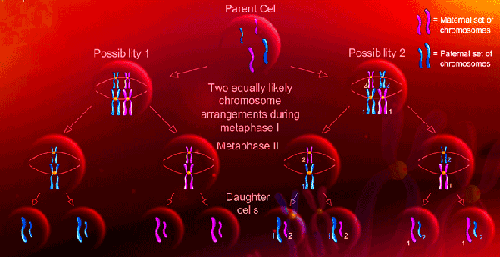 Crossing over of one of the chromosomes inherited from each of one’s parents occurs during meiosis in that parent. After chromosomal replication during gametogenesis, the four available chromatids from charismata. During this time, homologous sites on two chromatids can mesh with one another and exchange genetic information. Immediately after replication, the tetrad formed by replication contains two pairs of two identical chromatids. After crossing over, each of the four chromatids carries a unique set of genetic information. Mechanism of crossing over: Enzymes known as recombinases catalyze the reactions that allow for crossover to occur. A recombinase creates a nick in one strand of a DNA double helix. It allows the nicked strand to pull apart from its complementary strand. It is attached to one strand of the double helix on the opposite chromatid. A second nick allows the unannealed strand in the second double helix to pull apart. It is annealing to the remaining strand. It forms a structure known as a cross-strand exchange or a Holliday junction. The Holliday junction is a tetrahedral structure. It can be Pulled by other recombinases and move it along the four-stranded structure. (b) Independent Assortment: In most eukaryotes, a cell carries two copies of each gene called allele. Each parent passes on one allele to each offspring. Even without genetic recombination, each gamete contains a random assortment of chromatids. They choose randomly from each pair of chromatids available. With recombination, however, the gamete can receive a (mostly) random assortment of individual genes. Recombination results in a new combination of maternal and parental alleles on the same chromosome. Although the same genes appear in the same order, the alleles are different. This process explains why offspring from the same parents can look so different. In this way, it is theoretically possible to have any combination of parental alleles in an offspring. This fact that two alleles appear together in one offspring does not have any influence on the same combination. This theory of independent assortment of alleles is fundamental to genetic inheritance. Conservative Site-Specific Recombination: In this case, a mobile DNA element is inserted into a strand of DNA by means similar to that seen in crossover. A segment of DNA on the mobile element matches exactly with a segment of DNA on the target. It allows the enzymes called integrases to insert the rest of the mobile element into the target. Integrases are a special type of recombination. Trans-positional Recombination: trans-positional recombination does not require an identical strand of DNA in the mobile element to match the target DNA. Instead, the integrases introduce nicks in both the mobile element and the target DNA. It allows the mobile DNA to enter the sequence. The nicks are then removed by ligases. Nonhomologous Recombination: Recombination between DNA sequences that contain no sequence even though have similar homology is called non-homologous recombination or recombination end joining.